Excellent for polishing on wheels, laps, tumblers, etc. The M-5 polish is clearly the best all-round polish I have ever used. I demand a high, scratch free polish and regardless of the type of stone, this is consistently the best and fastest to bring a lusterous shine. The only drawback appears to be the fact that the stones are so shiny, they are more difficult to hold when setting! This is an all natural, non-hazardous polish. It is not crystalline based or alumina based and can be used on hard to polish items such as obsidian and won't scratch the surface. You can use this on jade and won't get the orange peel effect that you get with so many other polishes. It is also an excellent polish for turquoise. I use it on everything from thundereggs to jasper nuggets in the tumbler or petrified wood. I promise you won't be disappointed; it is an excellent, excellent product. Use it on a felt belt, leather, or canvas. Add just a bit of water, wait till nearly dry, and polish. You can also use it in the tumbler if you use the Super economy polish first. You won't be disappointed. This is my favorite pre-polish and the most economical. It is a crystalline quartz polish that can be used in the tumbler, in a lap, on a canvas covered disk, or on a felt or leather belt. Add one heaping tablespoon per 3 pounds of rocks to your tumbler or mix with a little water and paint onto the disk, belt, or canvas in your lap. Let partially dry before you use. You'll receive a lovely shine on agates, jaspers, petrified wood, thunder eggs, etc. It will produce a small amount of dust, so run a low fan and wear a dust mask and safety glasses. Tin oxide is used on a multitude of stones including topaz, smithsonite, beryl, coral, amber, danburite, and jadeite (Thai or Burmese jade). Also, it is a most excellent polish for agates, jaspers, petrified woods. This is "AA" grade, the highest quality tin oxide polish on the market. Mix just a little with some water and paint on to leather, felt, or #8 cotton duck wheel or belt. Allow to partially dry. Keep damp. For true nephrite jade (Wyoming, Alaska, or British Columbia), this is a fantastic polish. It is also excellent on rhodonite, malachite, lapis lazuli, azurite, and many other stones. It will give a wet look to quartz. Use it on agate or jasper slabs or thundereggs. It's messy but is an excellent polish. Use on leather, felt, or #8 canvas. Mix with water to the consistency of milk, paint on, polish your stones keeping a spray bottle handy to keep the surface damp. Chrome oxide is sold in 4 oz. jars. Sapphire Powder is used for polishing tourmaline, beryl, garnet, topaz, peridot, danburite, etc. It has a hardness of Mohs 9, and is therefore most useful for polishing very hard and/or difficult materials (but not corundum). This is for a 1 oz. jar. This is the highest purity cerium oxide you will find. Super Cerium, sometimes called French Cerium, brilliantly polishes with felt, leather, muslin or compound discs and belts. Optically graded, it is white and has a finer mesh than common optical grade cerium oxide. When diamond polishing and you think your stone is perfect, use a quarter teaspoon of this in a half cup of water for just one more hit and bring out the highest gloss possible. It will give an incredible luster to all glass and works well on all hard stones from obsidian to agate. This is an alumina based final polish for tumblers and laps. You'll receive a lovely shine on agates, jaspers, petrified wood, thunder eggs, etc. This also is an excellent prepolish before using the more expensive polishes. Cerium Oxide is the polish most commonly used for polishing glass but is excellent for polishing rocks - agates, quartz, opal, obsidian. Use for working out scratches in glass by making a slurry the consistency of milk and with your finger and a soft cloth, dip and rub out the scratch. For very deep scratches you need to use a super fine silicone carbide grit to start with and then polish with the cerium. This cerium is the orange cerium and is a high quality, optical grade. 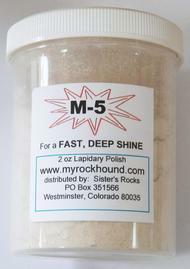 It is an excellent polish for rocks in a tumbler (1 ounce per pound of stone) or vibratory lap (slurry). Use on a hard cloth buffing wheel, leather, or #8 canvas. Mix with water to the consistency of milk, paint on, polish your stones keeping a spray bottle handy to keep the surface damp.